The CleanFinancial.com guide to political spread betting. Where to Spread Bet on the UK General Election? A number of firms offer spread betting on a range of political events such as the outcome of elections and referendums. Editor's Comment: Note that other companies may provide similar political markets. Just had a chat with the Financial Spreads dealing desk, they will be running their election markets until midday tomorrow. They are also taking big bets with clients on for +£100/seat... that puts my £5/seat bet to shame. Although, note that they are now only taking trades over the phone. Ipsos MORI plans to publish its exit poll at 10pm, the poll covers 20,000 people in +100 constituencies. It's certainly not 100% accurate but there could be a healthy move in the FTSE 100, EUR/GBP and GBP/USD (and election markets) as the poll is announced. Election Markets Open Until Midday 9 June? With 650 seats in parliament and the current market at 370 Conservative seats that suggests Mrs May will end up with a healthy 90 seat majority. The seats markets for the Conservative party and Labour party remain fluid. The Tories are up 10 seats on yesterday's quote, i.e. they've climbed to 371 - 375 from 361 - 365. The SNP seats quote has barely moved for the last month. There's little love for the Lib Dems although I've just had a small buy of their seats @ 12. They currently have 9 MPs and so I think the downside is limited... although judging by Tim Farron's election campaign... the upside is looking pretty limited too. I could well lose on the width of the spread. These are rare and looks like the firms are evening up their books. Labour Seats are currently trading at 202 to 206, a little off their earlier highs of 205 to 209. There's still no respite for the Tories or Lib Dems. Neither party seems to be getting much love (see prices below). A few weeks ago, the prices might only change about once a day... if you look at the hourly charts now, you'll see more frequent price moves. That would suggest that these markets are seeing more trades (and they're no longer just a PR market for the spread betting companies). Firstly, and putting all the nonsense of punting on election markets to once side, after another shocking attack in London on Saturday, our sincere condolences to all those who have lost loved ones, been hurt other or are otherwise suffering. 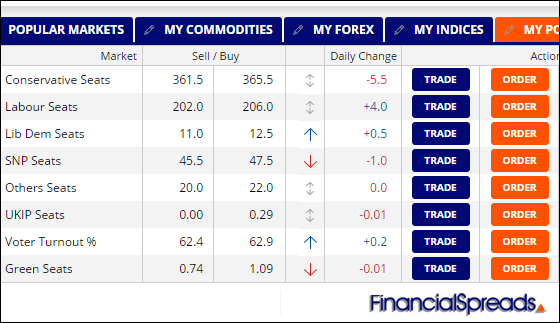 It's sombre morning here in the office but here's a quick price update from Financial Spreads, Sporting Index and Spreadex - see screenshots below from 11.30am, 5 Jun. The Conservative party, who are normally the 'law and order party', have gone up 7 seats from Friday's quote of 363 - 367 seats to 370 - 364. In the seesaw between the two main parties, Labour has lost most of those seats dropping 199 - 203 to 194.5 - 198.5. 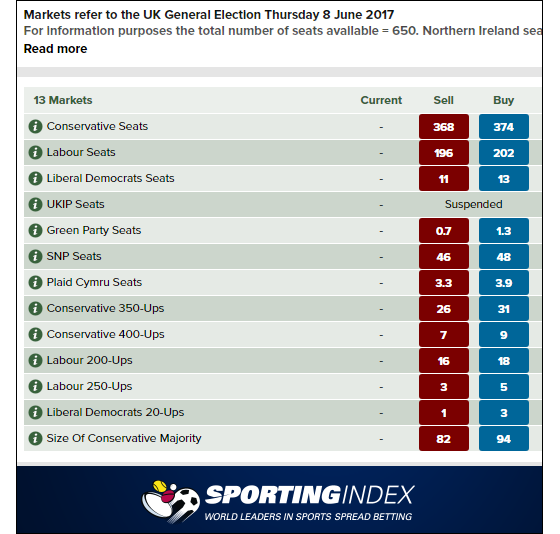 As usual with election betting, watch out for the wide spreads - Sporting Index and Spreadex are still offering markets with a 6 point spread on the main parties. Financial Spreads are more reasonable with a 4 point spread but that's still not that tight. FinancialSpreads.com have said they've got some big trades against Labour including one client who's shorted Labour seats at 175 for a cheeky £500/seat. I.e. their client will lose £500 for every seat that Labour gets above 175 and vice versa... they'll win £500 for every seat under 175. E.g. if Labour get today's estimate of 201 seats, the person will lose = (201 - 175) x £500 = 26 seats x £500/seat = £13,000 loss. E.g. if Labour get the 5 May estimate of 154, the person be down the pub after winning = (175 - 154) x £500 = 21 seats x £500/seat = £10,500 profit. That's a pretty big bet. The firm's max political bet size is actually £500/seat ... but you can also bet a more reasonable £1/seat. (You'll also get £1/seat with the other firms offering this market). Jeremy Corbyn is doing an election classic. He's promising the earth and the younger members of the electorate are lapping it up. Labour will invest in a modern, integrated, accessible and sustainable transport system that is reliable and affordable. That's all well and good but he seems to be forgetting that the trains were poor when they were run by the Government in the past... and the tax payer picked some very large bills in order to subsidise that poor service. That's a problem for another day though... and at the moment the Labour party seems to have a new energy. The Labour seats market has moved up by an impressive 50 seats. I.e. from a low around 150 - 154 seats to the current spread of 199 - 203 seats. As the chart below testifies, the Lib Dem market is in freefall. On 25 April they were forecast to get 29 - 31 seats, up from the 9 seats they currently have. Prior to yesterday's TV debate, the spread had already crashed to 15 - 17 seats. And now they've lost another 2 seats. That's careless. The market for UKIP seats market is holding steady around the 0.01 - 0.3 level. I.e. the price suggests that Paul Nuttall's motley crew won't be getting any seats in the House of Commons this time around. Who say's the electorate is stupid? Jeremy Corbyn's party is reaping the rewards of the Lib Dem collapse (or helping to cause it). 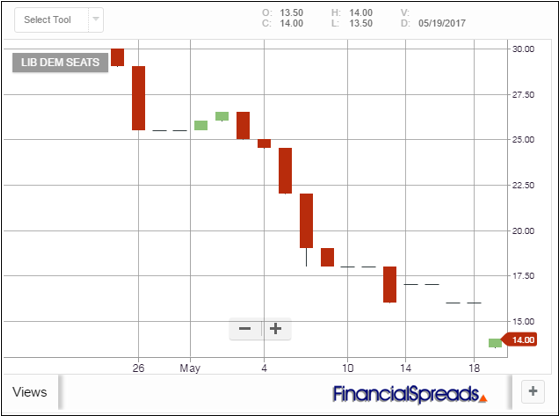 On 11 May Labour were trading at 150 - 154 (see story below). It looks like his retro-manifesto has gone down well with the party faithful and many of the younger potential voters (who weren't alive in the '70s and don't realise top rate income tax hit a lose-lose 83%). The Labour party seats market has now moved 20 seats higher to 170 - 174. Their manifesto has some well intentioned ideas but it proves again that Jeremy Corbyn is as ill-suited to office as Donald Trump. Luckily, Corbyn's also as unelectable as Kinnock. It's a shame the Labour party don't have a more Blairite candidate who can keep the Tory party in check. Below prices from Financial Spreads and IG. There's been no discernable change in the prices despite the Labour Party draft manifesto leak. Perhaps that says a lot about the current perception of the Labour party. Also see, how to spread bet on the UK election. IG's current price of 91 - 97 looks too good to be true. But... on closer inspection, i.e. reading the market information, you will see the IG Conservative Majority market is not a "seats" market. It's basically a binary market. It will be either close at 0 if the Conservative's don't get a majority or 100 if they do get a majority. As always, if something looks too good to be true with a market, re-check what you think you are trading. If you buy at 97 the maximum you can win is 3x your stake (100-97=3). That might still be tempting but note that you would lose 97 x your stake if the Tories don't get a majority. That's a very nasty downside. Jeremy Corbyn may have said "I think we can spend too much time worrying about polls" but he's got to be a little concerned. If he doesn't want to look at the polls then he certainly won't want to look at the spread betting markets. It's interesting to look back at the 2015 'seats' markets when "Red Ed" was considered "unelectable" but you also had UKIP eating into much of the Conservative heartland. A typical pre-election Conservative seats quote floated around the 280 - 286 level and a Labour party seats market would hover around 275 - 281. The two main parties were pretty much even in the spread betting markets. Jezza might want to keep his head in the sand for a little longer. 16-Mar-15 [12:17pm] The latest update on our blog takes a look at what the upcoming UK budget might look like and the potential impact on sterling. How Will the Budget Impact Sterling and the UK Economy? As we head towards the last UK budget before the general election, Alastair McCaig from IG discusses the trading options available for those looking to take a position. One new binary market asks whether Alex Salmond will be part of the next cabinet, whilst another considers whether there will be a second general election in 2015. In the run up to the election, IG asks Stephen Gallo, from BMO Capital Markets, about what elements to consider when attempting to capitalise on the political uncertainty inspired volatility in the foreign exchange markets. Despite the ECB also producing its own QE programme, Mr Gallo believes that EUR/GBP will be supported by the £0.65 level. Below, a quick look at how Spreadex is pricing up the market. Note, if you are logging into your Spreadex account, you need to log into 'Sports' rather than 'Financials' to access these prices. Interesting to see that UKIP are more likely to get an overall majority (100/1) than Nick Clegg's lot (500/1). Having said that, when fixed odds prices get to 100/1 they are pretty spurious to me. It wouldn't be difficult to find a bookie offering odds of 100/1 or 500/1 for Elvis being found alive. In a bar the other night I heard some of those clever lads at Goldman Sachs saying support for Labour and UKIP will drop significantly and the Conservatives would get an overall majority. The market isn't forecasting that though. For all the negative commentary around Red Ed, the spread on Conservative seats is 280 - 286, only a dash ahead of Labour's 275 - 281 seats. That's way off the 326 seats needed for a majority. The fixed odds 'No Overall Majority' is also priced at 1/5, so the current market suggests that we're in for another coalition. Note: 650 seats available, the Speakers seat and seats in Northern Ireland do not count towards this market. Note: These binary trades make up (close) at 100 if the party is named as having the most seats, otherwise they make up at 0. In the run up to the UK's General Election on Thursday 8 June 2017 investors can speculate on the number of seats that each of the major parties... and UKIP... will win. They can also speculate on voter turnout, the estimated turnout looks pretty miserable at around 62%. 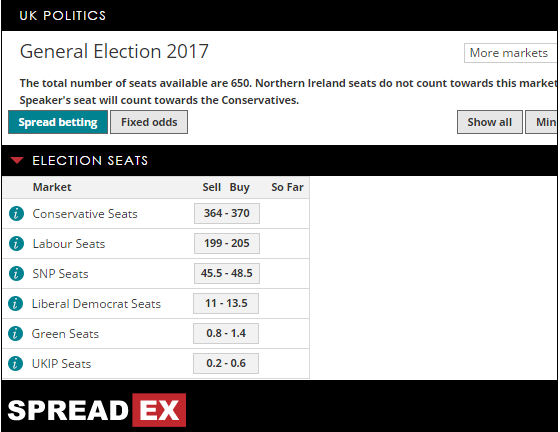 Looking at FinancialSpreads.com you can spread bet on the number of seats that the Conservatives will win. In this case, they have priced their Conservative Seats market at 397 - 401, i.e. suggesting that the Conservatives will win 397 - 401 seats. When spread betting on a "Seats" market you are simply betting in £x per seat. If you risked £5 per seat and the Conservative Seats market moved by 21 seats then that would alter your P&L by £105. £5 per seat x 21 seats = £105. Then you may decide to "buy" the market at 401 and bet, let's say, £4 per seat. If you "buy" the market you will make a profit of £4 for every seat more than 401 that the Conservatives win. Of course, such a bet also means that you will lose £4 for every seat that the Conservatives get less than 401. Put another way, should you buy a spread bet then your profits (or losses) are calculated by taking the difference between the final price of the market and the price you bought the spread at. You then multiply that price difference by the stake. Trading on financial markets, or political markets, is rarely straightforward. In this example, you had bet that Theresa May's party would win more than 401 seats. Of course, they could disappoint on election night. If Jeremy Corbyn's Labour Party did better than expected, the Conservatives might only win 368 seats. If so, you would end up losing this trade. Note: Conservative Seats market accurate as of 11- May-2017. Other firms may also offer this market. The Litecoin CFD and spread betting markets are limited but this live chart & prices show regular trading. Our Litecoin trading guide takes a look at Bitcoin's little brother and... » read guide. In-depth Bitcoin trading guide with live charts and prices. We cover Bitcoin CFDs, spread betting & binaries, we also review the digital currency's spread sizes, volatility and... » read guide. Chinese Renminbi trading guide with daily market updates, live USD/CNH prices & charts. Plus where to trade CNH, RMB and CNY markets, the basics of Chinese Yuan, worked examples and... » read guide. A quick guide to the US Dollar Index with a look at what it is, where you can trade it and where to get live charts. We also have analysis case studies and... » read guide. Turkish Lira spread betting guide with daily market updates. Plus live USD/TRY charts & prices, where to spread bet on Lira-based forex markets tax-free* and commission-free as well as how to trade and... » read guide. Russian Ruble spread betting guide with daily updates and COT reports. Plus, where to trade USD/RUB tax-free* and commission-free, worked examples... » read guide. The complete guide to spread getting on the housing market. Here we look where to spread bet on house prices, where to get live charts and prices, how to trade the UK market and... » read guide. Investors can now spread bet on the US nonfarm payrolls release. A number of firms have opened an NFP market so you can speculate on the key US employment figure... » read guide. 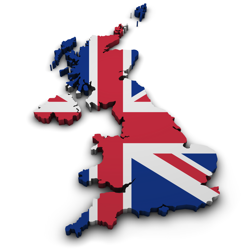 This guide to political spread betting reviews how to trade on the outcome of the UK General Election, which firms offer election spread betting markets, plus the latest news for... » read from top.